Explore this safe haven in Westchester’s poorest area. By almost any measure, Port Chester is the poorest community in Westchester County. About 80 percent of kids in the area come from low-income households. Port Chester children and teens often live in crowded apartments, and their parents work long hours in two or three low-paying jobs. The lack of supervision for children and parents' inability to afford afterschool activities leaves the youth at risk for experimenting in risky behaviors. 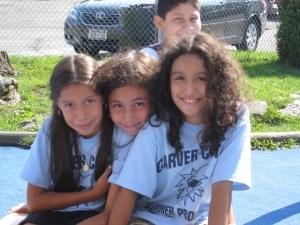 Carver Center seeks to attract these children to an environment that is recreational, supportive and safe. For the majority of such children, Carver is a home away from home— a secure and exciting place to be while their parents are at work. Carver Center is the primary community-based organization in Port Chester. It promotes educational, recreational, cultural and civic services for children and adults, with a particular focus on meeting the needs of underprivileged youth. Carver nurtures children to become competent, autonomous and valuable members of the community. Carver's signature program is the afterschool program. It has the distinction of being the only licensed afterschool program in Port Chester. The program's mission is to successfully contribute to the learning and healthy development of children by providing kids with a broad range of activities that fall under three areas: academic support, enrichment and recreation. Academic support includes homework assistance, tutoring and independent reading time. Enrichment opportunities include Suzuki violin, an art docent program, ballet, hip hop and African dance. Recreation offerings include free play, basketball, tennis and swimming. Carver Center has the only indoor swimming pool in Port Chester. It grants children open swim time at no additional cost to their families. There is also a recreational swim team, the Carver Sharks, which provides a great physical outlet for children who often live in small apartments with little to no outdoor space. Keeping children continuously safe, engaged and stimulated while at Carver is a center-wide effort. The staff and volunteers work diligently to ensure the mission of Carver is fulfilled and regularly seek feedback from children and their parents. Children in the afterschool program keep a journal that allows them to chronicle their thoughts and experiences on a weekly basis. The journals help the staff target and fine tune programming and activities, as well as identify cases where children might need additional support and guidance. By taking children's feedback into consideration, the Carver staff shows children that their opinions and feelings are valuable and that the feedback affects what goes on at their home away from home. Above all, Carver aims to offer programs that create opportunities for children to dream and experience things that could possibly change the course of their lives. Recently, some of the children went to the PepsiCo Research Center and made their own Gatorade. Perhaps a scientist will be born as a result of that experience. Or maybe the little girl who goes on a Carver trip to see The Nutcracker will blossom into a prima ballerina. After talking with members of the Carver Parent Organization, Carver staff learned that there were children who were hungry or at risk for hunger. Carver responded by opening the Carver Kids Cafe in collaboration with the Food Bank for Westchester. The Carver Kids Cafe serves a hot dinner freshly prepared on site by a chef every weeknight to the children in the afterschool program. There is also a Teen Center, where staff integrates kids in the middle and high school. In March 2010, the Teen Center took students on its annual college tour and brought along a few middle school children. The experience gave the middle schoolers a brief yet enticing introduction to college. When Michael returned from the trip, the 7th grader proudly displayed the college paraphernalia he had collected and boasted about adding himself to a university's mailing list. Michael was encouraged by the tour guide, who said, "It is never too early to start thinking about college." These stories and experiences are what Carver is about— meeting a child's basic needs while offering opportunities that will foster a bright future. Britani Griffin is a Carver Center staff member in the development office and afterschool program. A native of Port Chester, Griffin graduated from the University of Virginia in May of 2009 with a bachelor's degree in African American Studies.